In five years people might accuse me of contributing to a bubble related to 3D Printing (Swedish 3D printer manufacturer Arcam’s stock is already trading at P/E 63, whereas the American firm 3D Systems’ P/E is above 100…). Having spent my first week at the University of Cambridge and the Institute for Manufacturing (IfM) researching the topic, it is difficult not to be excited about its potential. While I will return to this subject with solid data and hopefully a more complete picture, let me share some initial thoughts below. Google Trends measures the amount of attention a particular topic receives. 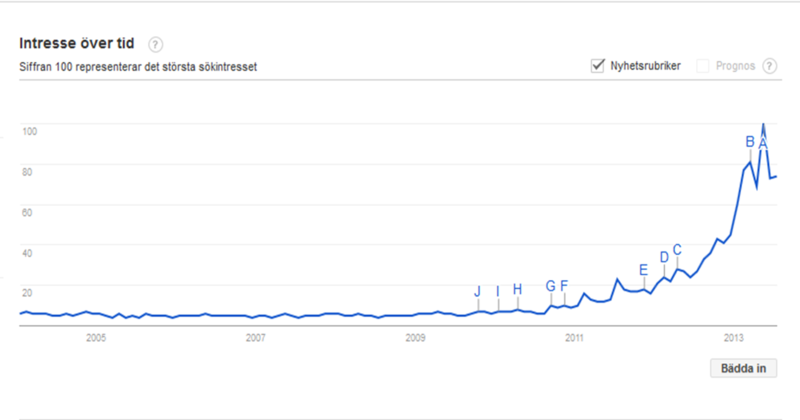 As indicated in the graph above, interest in the term ‘3D Printing’ has increased dramatically over the past 3 years. The term 3D Printing is somewhat perplexing as our understanding of printing has been associated with creating a pattern on a sheet of paper. Additive manufacturing is frequently used as a synonym and it is perhaps easier to make sense of the technology by using this notion instead. Additive manufacturing can be thought of as the opposite of subtractive manufacturing. So what is subtractive manufacturing then? Historically, manufacturing has largely been based upon a set of inputs which undergo a process of reduction – material is removed from the inputs by casting, machining and milling (etc) them into a desired shape. Additive manufacturing, on the other hand, is not based upon the removal of material. Instead, a three dimensional CAD file (a digital drawing of a component) is used as instruction telling a 3D printer how to manufacture an object. Using a mix of inputs, the printer then builds the object gradually, layer by layer until the it is ready. Material is not removed – material is added. Anyone with access to a CAD file and the right 3D printer can therefore manufacture something. Before 3D Printing, we never used the term subtractive manufacturing, it wasn’t needed as all manufacturing was subtractive. Well it isn’t any longer. Why then is this such a radical innovation and what are the potential implications? 1. The end of economies of scale? Putting those two curves in the same graph gives us an idea about how they are different. 2. Variation is no longer expensive! The industrial revolution was highly related to economies of scale. By building huge factories and introducing process innovations such as the assembly line, the cost per unit decreased. What used to be affordable only for wealthy people quickly became within reach for everybody and we saw the emergence of a consumption society of abundance. Cars, food and clothes became available in ever larger quantities and lower prices. Up until the 1970s, this was largely the growth miracle of industrial capitalism. The graph below serves as a neat illustration. The introduction of industrialized agriculture created huge economies of scale and prices declined sharply. With economies of scale, however, came a seemingly inevitable tradeoff in all manufacturing between variation and cost. If you wanted to increase variation, output would also by necessity be more expensive as less scale economies would be obtained. Henry Ford summarized this dilemma eloquently when he stated that Ford’s customers could have any color they wished as long as the car was black. Over the years, extensive work has been done in operations management to cope with this tradeoff and doing so has proven to be a key source of competitive advantage in many industries. Working with platforms and modularization, firms such as Volkswagen and the Swedish truck manufacturer Scania have been able to offer a higher degree of variation while still reaping the cost benefits related to economies of scale. Other firms like GM have struggled to position themselves in this tradeoff. As the company sought to lower its cost, the car portfolio became increasingly streamlined, implying that variation declined and that brands lost their unique identities. 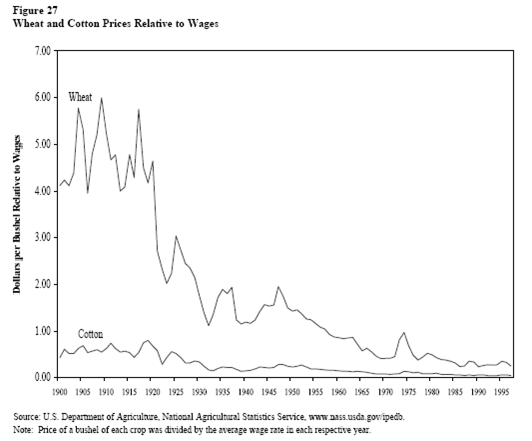 While huge improvements have been made since Henry Ford’s days, the tradeoff between variation and cost remains largely intact – essentially we’ve only learnt to cope with it in better ways, but it is in many regards inherent in industrial capitalism itself (figure below). If we put the two curves above in the same graph, we get a better idea about how 3D printing is currently emerging. 3D printing is being rapidly adopted in those applications where the need for variation is very high, but has been too costly to accomplish through subtractive manufacturing techniques. 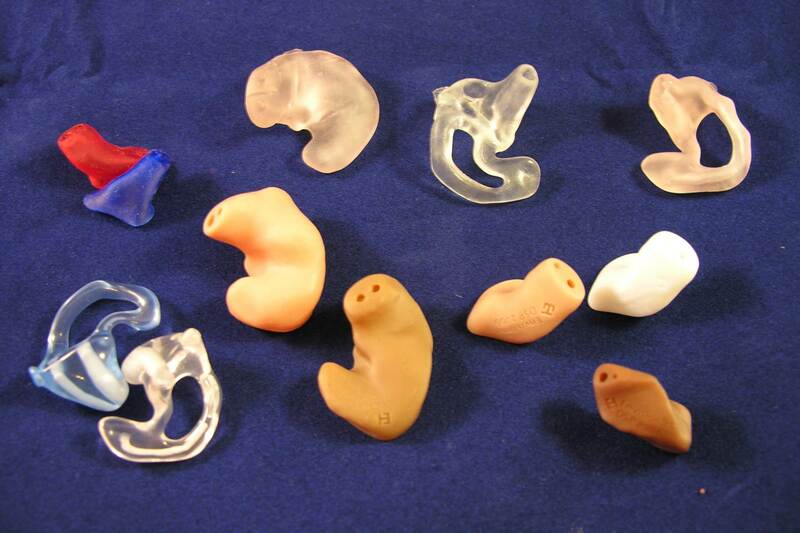 More than 10 million hearing aids have already been manufactured using 3D printers. Dental and medical implants are other early adopters of the technology as personalization can be accomplished at a low cost. The argument outlined above is perhaps the main reason why I believe 3D printing is a truly radical innovation. Fundamentally, the technology is a serious attempt to overcome one of the greatest tradeoffs in industrial capitalism. EOS, a German manufacturer states on their website that economies of scale are fading. 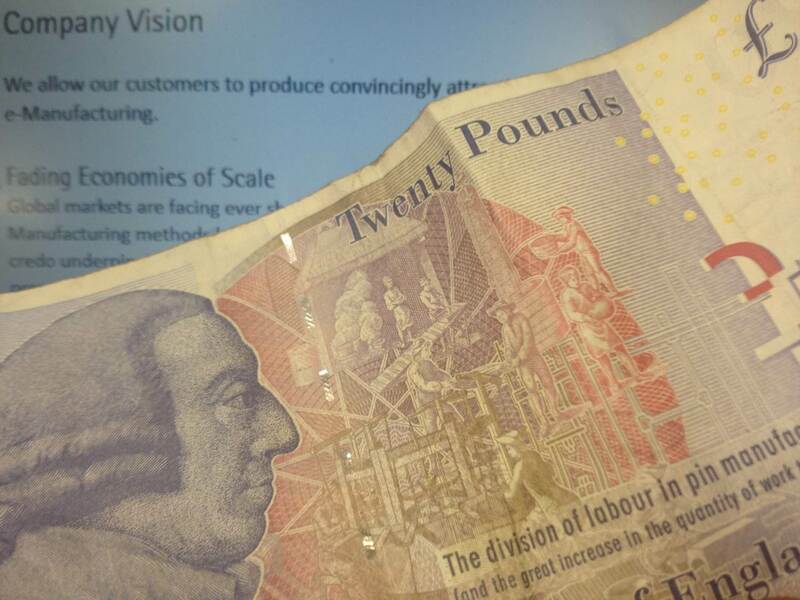 I put this statement next to a 20£ bill below which features Adam Smith, arguably the founder of modern economics who among other things pointed at economies of scale as a distinct characteristic of the industrial revolution. The point is that 3D printing has the potential to distort a key feature of industrialized economies. As 3D printing is additive, it becomes much easier and cheaper to manufacture things which are geometrically complex. Subtractive manufacturing is inherently clumsy and some shapes are more or less impossible (or very expensive) to manufacture through techniques of milling, machining or casting. Again, there is no such tradeoff with 3D printing. Consequently, 3D printing is being adopted rapidly in applications where geometrically complex components are needed. The aerospace industry would be one example of this. 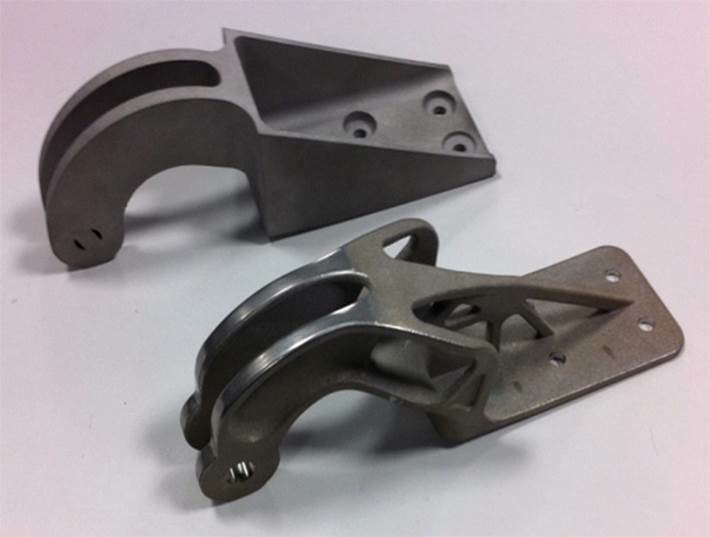 Reduced weight creates huge savings in fuel costs over the lifetime of an aircraft, by using 3D printing it becomes possible to create components that are lighter yet solve the same problem. According to Terry Wohlers, an expert on the 3D printing industry, Boeing is currently using 3D printed parts on some of their military aircrafts. 4. Product development becomes continuous and distributed? Rapid prototyping was one of the earliest applications of 3D printing technology. In development work, engineers could quickly and iteratively obtain physical versions of their ideas at little cost. As the performance of 3D printers has improved, they are increasingly being used not only for prototyping but for real products. Since manufacturing is no longer a difficulty and since it can be done by anyone with access to a 3D printer, development work becomes separated from manufacturing. In most industrial corporations, there’s a clash between R&D and operations. Manufacturing has historically imposed constraints on development work, with 3D printing this is no longer the case in certain applications. One consequence of the above is that product development can become continuous and distributed. Traditional R&D work comes in a batch. An idea moves from concept phases through product development and is then scaled up, manufactured and launched. The project had a starting time and an end. Eventually the product will become obsolete in the marketplace and the firm needs to have a new batch of development projects resulting in new, better generations of products. Basically, product lifecycles come and go. With 3D printing, development takes place in the non-physical domain (in CAD software) and manufacturing is not a challenge. Hence, development work doesn’t have to be organized as a batch, it has the potential of becoming a continuous process. That is, you don’t develop a product and sell one million units of it, then launch a new product. Instead, you develop one product, someone buys it, the same CAD file is improved, another person buys two units, then the next person buys a couple of units which are different from the first version. As the ancient Greek philosopher Heraclitus put it: “no man ever steps in the same river twice, for it’s not the same river and he’s not the same man”. Secondly, assuming production is the same and that it requires nothing but access to a 3D printer, development work can become distributed in space. I can work on the design of a product, send it over to someone on the other side of the planet who then develops it further, just like a word document. Manufacturing is not a concern as we have access to the same 3D printing technology, which is not constrained by economies of scale or geometrical complexity. Continuous and Distributed. That’s Wikipedia compared to Britannica. In the printed era, encyclopedias came as a batch (an edition) and they were developed by one organization. Being only one organization imposed constraints on the quality of the content and improvements couldn’t be made until the next edition (batch) would be released many years later. 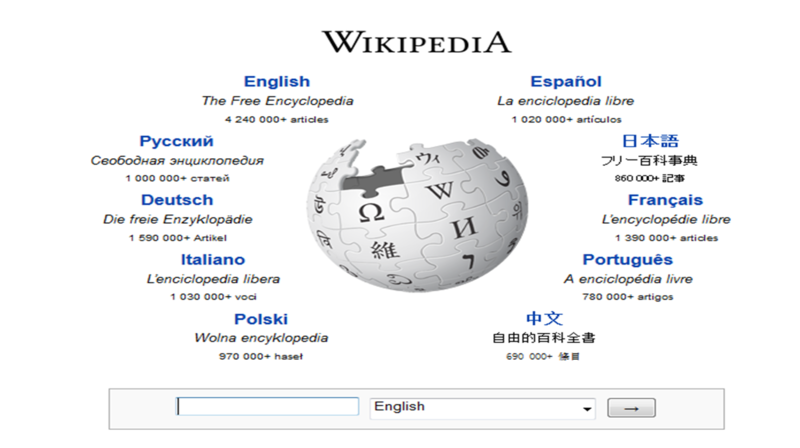 For these reasons, Wikipedia was bound to outperform printed encyclopedias over time – one organization could not compete with the accumulated knowledge of millions of individuals and it couldn’t match the continuous updating Wikipedia offered. Will the same thing happen with product development work thanks to 3D printing? 1. Which manufacturers will end up like Britannica with obsolete products due to the weaknesses of having a centralized, batch style development process? 2. How can companies successfully leverage online communities to make improvements to their products? 3. If manufacturing becomes democratized and available to anyone and it becomes easy to access CAD files online, how do firms ensure any returns from their development efforts? 5. Time and space no longer an issue? Subtractive manufacturing requires a fair bit of skills in logistics and supply chain management. Industrial firms have developed very precise channels making sure the right inputs are available at the right place, at the right time. Managing inventories, lead times, process times etc is by no means a trivial task. With 3D printing, it becomes a lot easier to cope with time and space. Files can be sent electronically to one place where an object is printed when it is needed, the only required logistics would be related to the input material and the printer itself in the first place. The right thing, at the right time, without all the complexities related to transportation of components and inputs back and forth across the planet. When it comes to literature, the only two actors needed are the author and the reader. All other actors (publishers, distributors, bookstores, websites) are intermediaries and several of them are being gradually removed as fewer are required when physical distribution is not necessary. What will happen to logistics companies and those firms obtaining a competitive advantage from superior supply chain management skills in those applications where 3D Printing prospers? A sixth advantage with additive manufacturing is related to waste. Subtractive manufacturing removes material, which often becomes useless. This is not only costly for a firm, it is ultimately also a drag on the environment. With additive manufacturing, you only use the resources needed to create a particular product. 3D printing will therefore be competitive in those applications where waste from subtractive manufacturing is highly expensive. • Affordability: Prices for commercial 3D printers range from $15,000 to more than $300,000. • Available materials: The amount of materials that can be used is still a limiting factor. Plastics, ceramics and certain metals are among the materials that can be used at present. Also, material costs are quite high and still impose constraints. • Precision: the robot arm of a 3D printer is still not as precise as an industrial engineering process, especially when it comes to adding several thin layers of different materials. • Strength: especially in load-bearing applications, strength is still an issue. • Time: Especially for larger objects, it might take a lot of time to print something. As we’re dealing with three dimensions, all input costs increase exponentially by the power of three when you create a larger object. If you have a 3*3*3cm toy it requires 27 cm^3 of material and time. An object twice as large needs 6*6*6 = 216 cm^3 of material and time. 216/27 = 8, if you double the size, cost increases by a factor 8! And if you triple the size it will increase by a factor 27. This is an inherent weakness in the technology and it helps us explain why it has initially emerged in rather small applications where the buyer is not very price sensitive, and where geometrical complexity and/or customization is important. Hearing aids are indeed good illustrations of this point. Having mentioned some of the limitations, the crucial question is if those technological obstacles will be overcome and when this would happen. At present, it seems that the technology is improving rapidly. Some of the leading manufacturers are gaining momentum, leaving the red numbers behind. As these companies grow they will invest progressively more in R&D while also attracting new firms to the industry, both factors contributing to increased performance and more widespread adoption. Improvements have indeed been very rapid in recent years. Nowadays the cheapest personal 3D printer sells for $500, five years ago you couldn’t find any 3D printers below $15 000. We can also expect the amount of available materials to increase in the coming years. The market is expected to expand from $1.4 billion in 2011 to about $3 billion in 2016. Bearing current limitations in mind, 3D printing will probably continue to grow in its current application areas: prototyping, and manufacturing (primarily in aerospace, automotive and medical industries). Whether it will remain in these areas or have a more widespread impact across the economy ultimately depends on the pace of development and the limitations of the technology. In the short term, we tend to overestimate the potential of a technology. Its long term impact, on the other hand, we often underestimate. Digital photography was hyped already back in the early 1980s. Nothing happened over the coming twenty years. But once the shift ook place it exceeded our imagination, for all actors involved: film manufacturers went bust, and so did many camera manufacturers, the industry became highly competitive, photography was amateurized putting an entire profession under pressure, camera stores and photographic stores went out of business and images are now captured and shared instantly in ways that would have been hard to even conceive of 20 years ago. Short term hype, long term impact beyond our expectations – this is usually the pattern for new technology. Why would 3D printing be an exception? It has so many new and radically different properties that may have far reaching consequences, now the questions are how and when.